Big business continues to make profits on the backs, legs, arms, heads, and LIVES, of working women and men. Please read the attached article. This article documents death and injuries from a horrible event in 1911. Today, thankfully, an event of this magnitude is extremely rare. However, every day there are about 800 lost time injuries in California. Some of these injuries cause death. Some of the injuries cause life-long pain and suffering. And, some injured workers make complete recoveries. I represent injured workers to minimize the injury’s impact on the injured workers’ life and, her or his family. And if necessary, to increase work-place safety by documenting an employer’s unsafe business practice. I hope this article reminds you that this great nation was built on hard work by millions of workers. And that each product you buy, and each service you use, was contributed to, in part or whole, by a worker. Please remember that during the production, manufacturing, or building process, a worker may have been injured or that a family may have lost a loved one. Saturday, March 25, marked the 116th anniversary of one of the most iconic and tragic events involving worker welfare and safety: the 1911 Triangle Shirtwaist Factory fire. The factory was located on the top three floors of the ten-story Asch Building in New York City, and produced women’s blouses (shirtwaists). Workers were mostly immigrant women, some as young as 14. A year before the fire, the workers participated in a city-wide demonstration demanding improved working conditions. Conditions prompting the march included long hours, low wages, poor ventilation, and cramped and dirty working conditions. 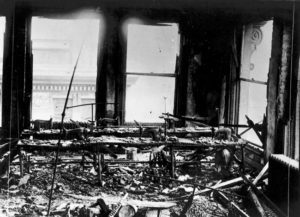 On March 25, 1911, fire broke on the ninth floor. The floors were strewn with combustible scraps and machine oil. Workers described bits of thread hanging suspended in the heavy air. Attempts to control the fire proved fruitless. The fire escape collapsed. As the fire grew, many workers, particularly on the ninth floor, found no means of exit. Many jumped to certain death. 123 women and 23 men died in the fire. Accounts from survivors and witnesses in the streets were horrific. For a next day newspaper account, click here. Victims received little or no compensation. Meanwhile, the two owners were acquitted of criminal charges and recovered a large insurance settlement. . Several commissions were formed to study the event and possible improvements in worker welfare. Women, particularly immigrant women, comprise the majority of the workforce in the garment industry. Adequate protection must be preserved to curtail potential abusive practices. Recently, the Garment Worker Center and the UCLA Labor Center surveyed workers in the Los Angeles garment industry. Their findings report conditions that echoed the voices of 116 years earlier; including poor ventilation, excessive heat and dust, locked doors, dirty and poorly maintained workplaces. To read the December 2016 survey results, click here and scroll down to ‘Find out more and download the report here’. Stay tuned to see what’s up.